We are down to about a fourth of the teams that started the trek through the playoffs. But, this is only a third of the way to the prize. We have 88 teams, each of which knows that only 44 will be called district champions. To those that persevere to win the district title, we say “Congratulations. You are only half way there.” Such is the six week playoff schedule. But, before we look back to last week and forward to this week, let’s take a look at the effectiveness of the formula MSHSAA uses to seed each team into its district tournament. Above, you will see the total wins and losses for each seed level, along with the percentages. As is shown, there was at least one win in round one for each seed. This is the first year we have seen a No. 8 seed defeat a No. 1 seed. The column highlighted in red is the winning percentage for each class through two rounds. The MSHSAA formula proves its effectiveness with the steady stair steps down from the No. 1 seeds winning 91 percent of the time on down to the No. 8 seeds winning 3 percent of the time. These are close to the results for the first three years of this formula. That means there is consistency to the results from year to year. Only 25 of the 44 districts will have a championship game between the No 1 and No 2 seeds. There are three districts where neither of the top two seeds survived to play in the championship game. There are three No. 5 seeds that remain. Those three are Class 4, District 3 St. Dominic; Class 1, District 3 Drexel and Class 1, District 8 Maysville. Interestingly, the two lowest remaining seeds are in the larger classes. In class 5, District 3 No. 6 seed Parkway West will try to extend its string of upsets to three when the Longhorns square off against No. 1 seed Fort Zumwalt North. Closer to home, in Class 6, District 4 the No. 7 seed Blue Springs will travel to Springfield to face No. 1 seed Kickapoo. As noted last week, Riverview Gardens became the first No. 8 seed to defeat a No. 1 seed when they upended Clayton. What happened when the No. 8 advanced to the semi-finals? In what had to have been an emotional game, Riverview Gardens was edged when a field goal by No. 5 St. Dominic broke a scoreless tie in overtime. We were that close to having a No. 8 seed in a district championship game. How exciting. 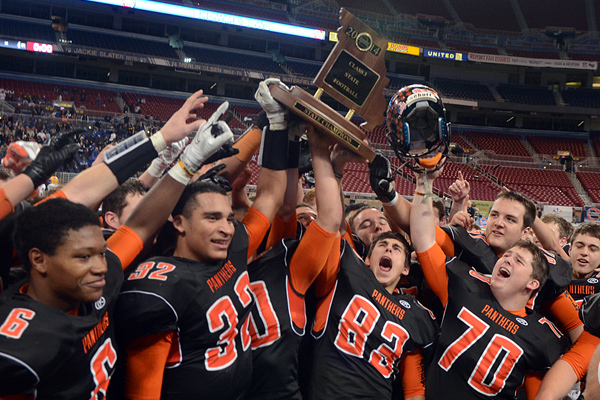 As would be expected, all six defending state champions remain in the 2015 hunt for another title. The games in which they are involved make for some interesting high school football. Defending champion Christian Brothers takes its 11-0 record and 24 game winning streak into the District 2 title game. Their opponent? Hazelwood Central, which was the last team to beat Christian Brothers back on November 16, 2013, 25 games ago for the Cadets. Defending champion Battle, 9-2, may be playing a No. 3 seed in Lebanon, but three of Lebanon’s four losses were at the hands of very good football teams. Lebanon lost to Class 6 Joplin, Class 6 Kickapoo and a powerhouse Class 4 West Plains. But Battle’s two losses were against very good teams from Hannibal and Jefferson City. It is safe to say that Battle has a battle on its hands. Also, please keep in mind that Battle High School has only existed for three years. Yes, they won a state title in its second year of existence. Webb City is one of two Missouri six time defending champions. The Cardinals take their 11-0 record and 39 game winning streak into the championship game against No. 2 seed West Plains. The Zizzers’ only loss came at the hands of Class 6 Kickapoo. Incidentally, Webb City’s seven point semi-final win over Carl Junction was their closest game since its 27-24 overtime win on September 27, 2013 against Har-Ber of Springdale, Arkansas. That was thirty-six games ago. Oak Grove will be the only defending champion playing as the underdog on the road. The Panthers have two losses. One was against a very good Class 4 Harrisonville team. The other was a home loss against the Bulldogs of Odessa. Oak Grove gets their opportunity for revenge against the Bulldogs as they travel to Odessa, District 7’s No. 1 seed. Defending champion Lamar takes its perfect 11-0 record into the district championship game against the upstart Eagles of Summit Christian. The Tigers’ last loss was in the 2014 regular season finale against a very good Class 4 Carl Junction. Summit Christian’s first full varsity season of football competition was in the Fall of 2013. This year’s 10-1 record is the Eagles’ first winning season. Defending champion Valle Catholic is going for its seventh consecutive football title. They have a 48 game winning streak, last losing against Herculaneum, 39-41, on October 12, 2012. No. 2 seed Mark Twain is just starting what it hopes will be a lengthy winning streak. The Tigers’ 11 2015 wins surpasses the 9 wins they were able to accumulate over the last four seasons. Mark Twains’ last winning season was in the Fall of 2011. The Jaguars are back. After winning the state championship in 2011, Blue Springs South is undefeated and ready to challenge No. 1 seed Francis Howell. Last year the Vikings defeated Blue Springs South in the district semi-final game on its way to the state semi’s where they lost to Rockhurst. This year Blue Springs South is playing like a championship team, not the one who played about .500 ball for three years. Blue Springs is in both familiar and unfamiliar territory. District championship game? Been there, done that twice in the last three years on its way to the state championship. Seventh seed? The Wildcats are very unfamiliar with that. It seems like they chose to ignore that as they prepare as the No. 7 seed to travel to No. 1 seed Kickapoo. It took a half of a season to put this rendition of the Wildcats together. It will be interesting to see how far they can go. Belton could be an easy team to look past. The Pirates are coming off of a 4-7 year and were seeded fourth in the sixth district. But, their three losses are to very good teams. They held serve against No. 5 seed Willard in the first round. Then, they walloped Smith-Cotton, the undefeated No. 1 seed. The Pirates will travel to do battle with the undefeated, No. 2 seed Tigers of Carthage. Truman has made significant progress in each of the last two years. But, the Patriots will have their hands full when they travel to No. 1 seed Fort Osage. The Indians will try to advance to their fourth straight quarterfinal. The Park Hill Trojans will travel to Staley for what should be a great football game. The No. 2 seed Trojans’ only loss was to Blue Springs South, while the Falcon’s only loss was to Fort Osage. Center has shown few problems since being elevated to class 4 from class 3 two years ago. They will take their No. 2 seed, one loss team to Harrisonville this weekend. The No. 1 seed Wildcats look to repeat their district title. The No. 3 seed Pirates of Platte County have an uphill battle on their hands as they travel to play on the No. 1 seed Kearney’s home field. The Pirates will have to avenge a home loss to Kearney earlier this year 0-36. The last Pirate win over the Bulldogs was 28-27 in 2012. As noted earlier this is a rematch from earlier this year, while No. 3 seed Oak Grove seeks to defend its state title from a year ago when they travel to No. 1 seed Odessa. No. 3 seed Richmond appears to have a difficult time traveling to No. 1 seed Maryville. The only Spoofhound loss in the last four years was last year to Oak Grove, who went on to win the state title. The last three years, Lafayette County was the No. 1 seed in this district. The last three years, they played in the district championship game. In those three years, the Huskers suffered their only loss in this game to No. 2 seeds Holden, Lawson and South Callaway. This year Lafayette County will travel to Father Tolten Regional Catholic School as the No. 2 seed. The Huskers hope their change of seed helps them knock off the one loss Trailblazers. We see a few district title games that are rematches from earlier this year. This title game is a rematch from last year’s title game. Last year, East Buchanan as the No. 2 seed defeated Brookfield. This year East Buchanan comes in as the No. 1 seed as they host Brookfield. West Platte is a good example of the effectiveness of the MSHSAA seeding formula. The Blue Jays’ 3-6 record didn’t fool the formula as they were seeded No. 2. North Platte, also 3-6 during the regular season was seeded No. 4. I really like watching teams do well that perhaps are overlooked by others. I think this game is a good example of that. The Wolverines of Maysville entered district play as the No. 5 seed. With their two district wins they are now 6-5. They will travel to the three time defending district champion, the Penney Hornets. There are so many good games with good themes and stories that if you can’t find one you like, then you just aren’t paying attention. So, please go find one of these games and enjoy. Next week we will examine the 44 district champions as they head on into the second half of the playoff schedule.